Figure 3-22. - Exploratory stroke. Figure 3-23. - Scaling strokes. safest scaling stroke because the cutting edge of the instrument does not come in contact with the epithelial attachment. The horizontal stroke will parallel the gingival margin. Use this stroke cautiously to remove supragingival deposits from the facial and lingual surfaces of the teeth. 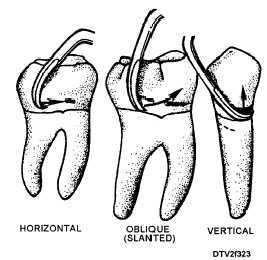 The oblique or slanted stroke is made at a 45° angle to the long axis of the tooth. Use this stroke to scale the majority of the tooth's surfaces. However, the direction of the stroke that you select will depend on the type of instrument, the area of the mouth, and the tooth surface involved. 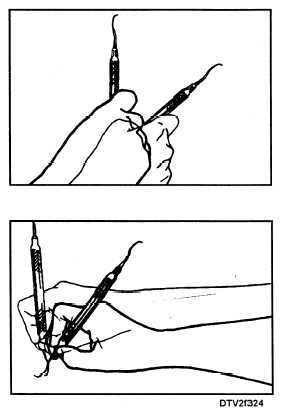 Activating the Stroke Before starting the working phase of the stroke, tighten your grip on the instrument. Use your hand, wrist, and arm to activate the instrument (fig. 3-24). Avoid scaling with independent finger movements as this technique is extremely fatiguing. Your working stroke should be short, controlled, decisive, and directed in a manner to protect the tissues from trauma. With a short stroke, you can maintain control of the instrument and adapt the cutting edge to variations in the tooth surface. Always keep as much of the working blade (not just the point) on the tooth as possible. The exact length of the stroke depends on the height of the deposits. During the working stroke, you should slightly increase the pressure on the fulcrum to balance the pressure of the instrument on the tooth. Never remove calculus by shaving it in layers. 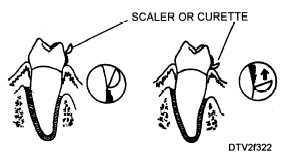 Shaving often leaves a thin layer of calculus, which is difficult to distinguish from the tooth surface. This thin layer can serve as a nucleus for new plaque and calculus formation. After you have completed the scaling procedure, you are ready to polish the teeth. Figure 3-24. - Instrument activation.